Why Carnival and comScore made headlines as stocks soared on Tuesday. 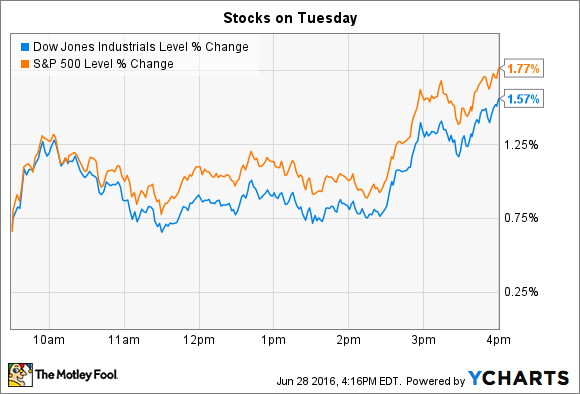 What a difference a day can make in the stock market. After abandoning shares over the past two trading sessions, investors weren't as worried about Brexit on Tuesday and instead went bargain shopping. Two fresh reports pointed to steady momentum for the U.S. economy. Consumer confidence ticked higher for June, according to the Conference Board. Meanwhile, housing prices logged their sixth straight quarter of 5% or better growth, the S&P Dow Jones Indices said. As for individual stocks, Carnival (NYSE:CCL) and comScore (NASDAQOTH:SCOR) were among the biggest stocks making headlines on Tuesday. Audience measurement specialist comScore's stock plunged 19% on evidence of widening accounting issues. The company missed a self-imposed deadline to update investors on its financial results for calendar 2015 and for the first quarter of 2016. Accounting problems the SEC brought to light back in February triggered an internal review. The company initially thought the audit would just hold up its annual report filing by about two weeks. However, as the review progressed, it became clear that things wouldn't be so simple. As a result, comScore further delayed its annual report filing, put its investor-day meeting on hold, and then delayed its first-quarter report. Yesterday marked the passing of another key deadline without added clarity for investors. Auditors couldn't complete the review because they "require further time to evaluate the information collected and reach and evaluate final conclusions," management explained in a filing with the SEC. comScore gave no indication on when auditors would be done, except to say that shareholders will see the annual and quarterly figures "as soon as reasonably practicable." In the meantime, investors can only speculate as to why the review is taking so long and which important financial numbers might need to be restated. Carnival's stock saw heavy trading but didn't budge much in price after the company posted its quarterly earnings results. The cruise service's top- and bottom-line figures both beat consensus estimates, with revenue rising 3% and net income more than doubling to produce $0.49 per share of adjusted earnings. Wall Street pros were looking for 2% higher sales and profit of $0.39 per share. Carnival's strict pricing and inventory management helped push average guest spending higher. In fact, customers shelled out 4% more per room day this quarter, trouncing management's guidance for a 2% uptick. Cruise operating costs fell 2% instead of rising as executives had forecast, but only because of the timing of a few large expenses. "Our strong second quarter demonstrates continued momentum," CEO Arnold Donald said in a press release. The expense delay that boosted Q2's profits will hurt Q3's numbers, the company said. Carnival expects to produce about $1.83 per share, which is below consensus estimates calling for $1.98 per share. Meanwhile, higher fuel costs and unfavorable foreign currency swings are on pace to take a $0.17-per-share bite out of full-year earnings. Improving profitability is completely offsetting that drag, though, and so the company was able to affirm its outlook. Investors call expect $3.30 per share of profit this year, up more than 20% from 2015's result.